Abstract: Gneisses from the deep structural levels of the European Variscan Belt are well exposed in the Central Sredna Gora in Bulgaria. In general, migmatites predominate, but unmigmatized domains (or domains with incipient migmatization) are also documented in this area. This paper presents new structural, petrographic and U-Pb isotope geochronological data from such an unmigmatized part of the Variscan high-grade metamorphic basement (the Koprivshtitsa Unit). A predominant part of this unit represents an alternation of metagranitoids and metabasites. The protolith crystallization age of the metagranitoids is constrained at 491.5 ± 7.6 Ma by U-Pb laser ablation method on zircons. This age coincides with the previously available Late Cambrian protolith ages of metabasic rocks that crop out within the adjacent migmatitic unit. The Korpivshtitsa Unit comprises also lesser orthogneisses with Late Neoproterozoic protoliths. Based on the available local and regional paleogeographic reconstruction schemes, we sug- gest that the Upper Cambrian magmatic rocks intruded Upper Neoproterozoic crust during the initial opening stages of the Rheic Ocean or a related basin. Subsequently, both were involved in the Variscan high-grade deformation. The contact of the Koprivshitsa Unit with the migmatitic part of the metamorphic complex coincides with a north-vergent greenschist facies thrust zone – the Chuminska Shear Zone. The exact time of the shearing is still not well constrained but it clearly postdates the Variscan high-temperature metamorphism of the gneisses. Abstract: The Tribeč granitic core (Tatric Superunit, Western Carpathians, Slovakia) is formed by Devonian/Lower Carboniferous, calc-alkaline I- and S-type granitic rocks and their altered equivalents, which provide a rare opportunity to study the Variscan magmatic, post-magmatic and tectonic evolution. The calculated P-T-X path of I-type granitic rocks, based on Fe-Ti oxides, hornblende, titanite and mica-bearing equilibria, illustrates changes in redox evolution. There is a transition from magmatic stage at T ca. 800—850 °C and moderate oxygen fugacity (FMQ buffer) to an oxida- tion event at 600 °C between HM and NNO up to the oxidation peak at 480 °C and HM buffer, to the final reduction at ca. 470 °C at ∆NN = 3.3. Thus, the post-magmatic Variscan history recorded in I-type tonalites shows at early stage pronounced oxidation and low temperature shift back to reduction. The S-type granites originated at temperature 700—750 °C at lower water activity and temperature. The P-T conditions of mineral reactions in altered granitoids at Variscan time (both I and S-types) correspond to greenschist facies involving formation of secondary biotite. The Tribeč granite pluton recently shows horizontal and vertical zoning: from the west side toward the east S-type grano- diorites replace I-type tonalites and these medium/coarse-grained granitoids are vertically overlain by their altered equivalents in greenschist facies. Along the Tribeč mountain ridge, younger undeformed leucocratic granite dykes in age 342 ± 4.4 Ma cut these metasomatically altered granitic rocks and thus post-date the alteration process. The overlaying sheet of the altered granites is in a low-angle superposition on undeformed granitoids and forms “a granite duplex” within Alpine Tatric Superunit, which resulted from a syn-collisional Variscan thrusting event and melt formation ~ 340 Ma. The process of alteration may have been responsible for shifting the oxidation trend to the observed partial reduction. Abstract: The causes for the Middle to Late Jurassic tectonic processes in the Northern Calcareous Alps are still contro- versially discussed. There are several contrasting models for these processes, formerly designated “Jurassic gravitational tectonics”. Whereas in the Dinarides or the Western Carpathians Jurassic ophiolite obduction and a Jurassic mountain building process with nappe thrusting is widely accepted, equivalent processes are still questioned for the Eastern Alps. For the Northern Calcareous Alps, an Early Cretaceous nappe thrusting process is widely favoured instead of a Jurassic one, obviously all other Jurassic features are nearly identical in the Northern Calcareous Alps, the Western Carpathians and the Dinarides. 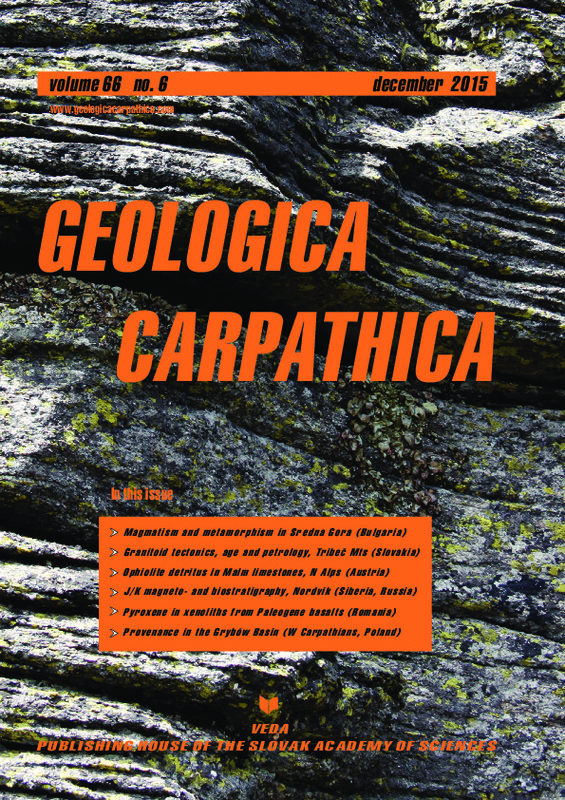 In contrast, the Jurassic basin evolutionary processes, as best documented in the Northern Calcareous Alps, were in recent times adopted to explain the Jurassic tectonic processes in the Carpathians and Dinarides. Whereas in the Western Carpathians Neotethys oceanic material is incorporated in the mélanges and in the Dinarides huge ophiolite nappes are preserved above the Jurassic basin fills and mélanges, Jurassic ophiolites or ophiolitic remains are not clearly documented in the Northern Calcareous Alps. Here we present chrome spinel analyses of ophiolitic detritic material from Kimmeridgian allodapic limestones in the central Northern Calcareous Alps. The Kimmeridgian age is proven by the occurrence of the benthic foraminifera Protopeneroplis striata and Labyrinthina mirabilis, the dasycladalean algae Salpingoporella pygmea, and the alga incertae sedis Pseudolithocodium carpathicum. From the geochemical composition the analysed spinels are pleonastes and show a dominance of Al-chromites (Fe3+—Cr3+—Al3+ diagram). In the Mg/(Mg + Fe2+) vs. Cr/(Cr + Al) diagram they can be classified as type II ophiolites and in the TiO2 vs. Al2O3 diagram they plot into the SSZ peridotite field. All together this points to a harzburgite provenance of the analysed spinels as known from the Jurassic supra- subduction ophiolites well preserved in the Dinarides/Albanides. These data clearly indicate Late Jurassic erosion of obducted ophiolites before their final sealing by the Late Jurassic—earliest Cretaceous carbonate platform pattern. Abstract: In this contribution we examine and discuss recently published magnetostratigraphic data from the Nordvik section (north Siberia) around the Tithonian—Berriasian (J/K) boundary, with a special emphasis on calibration with biostratigraphy and the reliability of both the fossil and magnetic records, as well as sedimentation rates. Specifically, we discuss original new interpretations by Bragin et al. (2013) and the commentary on that work by Guzhikov (2013). We consider some limitations of the Nordvik section, and conclude that the base of M18r, because it is in a condensed part of the sequence, makes a poor contender for precise long-range correlation. We discuss the lack of ammonites at several magnetozone boundaries, and whether the bases of the local zones of Craspedites taimyrensis and Arctoteuthis tehamaensis can be used to bracket the correlative horizon of Calpionella alpina, a widespread marker in the middle of M19n.2n in Tethys. Abstract: In this paper we present the petrography and geochemistry of a recently collected lherzolite-websterite xeno- lith series and of clinopyroxene xenocrysts, hosted in Upper Cretaceous—Paleogene basanites of Poiana Ruscă (Romania), whose xenoliths show notable orthopyroxene-enrichment. In the series a slightly deformed porphyroclastic-equigranular textured series could represent the early mantle characteristics, and in many cases notable orthopyroxene growth and poikilitic texture formation was observed. The most abundant mantle lithology, Type A xenoliths have high Al- and Na-contents but low mg# of the pyroxenes and low cr# of spinel suggesting a low degree ( < 10 %) of mafic melt removal. They are also generally poor in overall REE-s (rare earth elements) and have flat REY (rare earth elements + Y) patterns with slight LREE-depletion. The geochemistry of the Type A xenoliths and calculated melt composition in equilibrium with the xenolith clinopyroxenes suggests that the percolating melt causing the poikilitization can be linked to a mafic, Al-Na-rich, volatile-poor melt and show similarity with the Late Cretaceous—Paleogene (66—72 Ma) subduc- tion-related andesitic magmatism of Poiana Ruscă. Type B xenoliths, with their slightly different chemistry, suggest that, after the ancient depletion, the mantle went through a slight metasomatic event. A subsequent passage of mafic melts in the mantle, with similar compositions to the older andesitic magmatism of Poiana Ruscă, is recorded in the pyroxenites (Fe-rich xenoliths), whereas the megacrysts seem to be cogenetic with the host basanite. The Poiana Ruscă xenoliths differ from the orthopyroxene-enriched mantle xenoliths described previously from the Carpathian-Pannonian Region and from the Dacia block. Abstract: The Grybów Unit occurring in the Ropa tectonic window was the subject of micropaleontological and geochemi- cal investigation. Studies, based on calcareous nannofossils, proved that the level of reworked microfossil is not higher than 22 % and it varies between two sections. Quantitative analyses of the reworked assemblages confirmed the domi- nation of Cretaceous and Middle Eocene species. The Sub-Grybów Beds, Grybów Marl Formation and Krosno Beds were assigned to the Late Oligocene and represent the terminal flysch facies. Detrital material accumulated in the Oligocene sediments originated from the Marmarosh Massif, which is the eastern prolongation of the Fore-Magura Ridge. The microscopically obtained petrological features agree with the chemical composition of the samples. Mica flakes, rounded grains of glauconite, heavy mineral assemblage, including abraded grains of zircon, rutile and tourma- line as well as charred pieces of plant tissues are reworked components. Enrichment in zircon and rutile is confirmed geochemically by positive correlation between Zr and SiO2. Zr addition is illustrated on 10 ×Al2O3—Zr—200 ×TiO2 and Zr/Sc vs. Th/Sc diagrams. Interpretation of the A—CN—K diagram and variety of CIA and CPA values indicate that the source rocks were intensely weathered granite-type rocks.